The Asus OMG Days sale will kick off tomorrow at 12 PM on Flipkart. As per the information on the landing page, the sale is announced by Asus to celebrate the sale of 2 million unit in 2018. 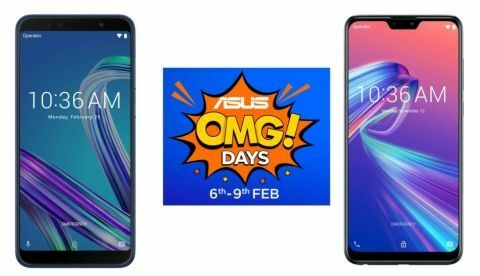 The Asus has announced its “Asus OMG Days sale” on Flipkart that will begin on February 6 and will last till February 10. According to the information on Flipkart, the sale celebrates sale of more than 2 millions units in 2018. During the sale, there will be a number of Asus smartphones that will receive a price cut down including its one of the most popular device Asus Zenfone Max Pro M2. So, let’s take a look at some of the best deals that have been revealed by the company on Flipkart till the date. The Asus Zenfone Max Pro M2 is available in three variants 3GB/32GB, 4GB/64GB, and 6GB/64GB storage models. All three devices are currently available in India at a price of Rs 12,999, Rs 14,999, and Rs 16,999 respectively. However, during the sale, you can grab the 3GB variant for Rs 11,999, 4GB variant for Rs 13,999 and the 6GB variant at a discounted price of Rs 15,999. Check out the deal here. The Asus Zenfone Max Pro M1 is a successor to the Asus Zenfone Max Pro M2. The phone has been launched in two variants 3GB/32GB and 4GB/64GB storage models. Both the variants will receive a price cut down of Rs 1,000, which will bring down the effective price to Rs 8,999 and Rs 10,999 respectively. Check out the deal here. The Asus flagship device Zenfone 5Z will receive a heavy discount during the sale. The phone comes in three variants 6GB/64GB, 6GB/128GB, and 8GB/256GB storage models. All three variants are going to available on the sale with a flat Rs 8,000 discount. Buyers will also be able to buy the device on no-cost EMI. Check out the deal here. The Asus Zenfone Max M2 all variants will get a flat Rs 1,000 off during the sale. One can also opt to buy the phone on no-cost EMI, which will be available with 3 months and 6 months options. Check out the deal here.